Younger onset dementia is the term used to describe people under the age of 65 years who have been diagnosed with a type of dementia. There is estimated to be more than 25,000 people living in Australia with younger onset dementia and these people often face various challenges. People under the age of 65 years are often still working and they may be the family’s only breadwinner. Many are raising dependent children and some are also caring for an elderly relative. People with younger onset dementia have numerous decisions to make and a range of service options to consider as their dementia progresses. They frequently report not knowing what services are available nor knowing how to access those services. Dementia Australia was funded by the NSW Family and Community Services; Ageing, Disability and Home Care to develop the “Support Pathways for people with younger onset dementia: Referral and Service Options”. This is a comprehensive guide to health, social, community, legal services and resources which could be useful for people with younger onset dementia. The guide is divided into sections making it easier for people to locate the service they are after. It is equally useful for people with younger onset dementia, their families and carers and for members of the health and service professions. 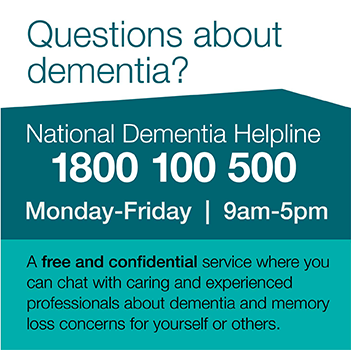 People with younger onset dementia can now be assisted through the Australian National Disability Insurance Scheme. It is an important time for people with younger onset dementia to know what services and supports are available to them. This booklet is a reference point for locating and choosing helpful and meaningful support services.